Like Jack Nicholson and Peter Fonda, your dog longs for the open road. 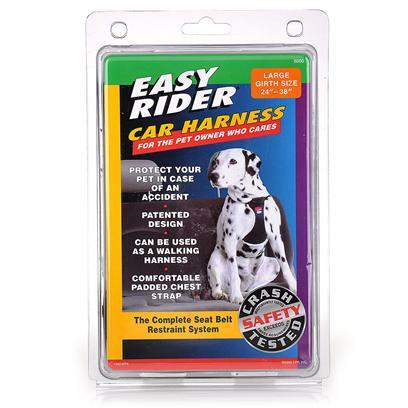 Keep him safe when he's along for the ride with the Easy Rider Car Harness. It prevents him from being thrown and injured in case of short stops or accidents, so you don't have to worry. The easy-to-use harness connects to any front or rear seat belt and keeps your dog confined yet comfortable. It features secure metal hardware and a padded chest strap; plus, it doubles as a walking harness. Follow instructions on packaging to ensure your dog is safe and secure when riding in the car.